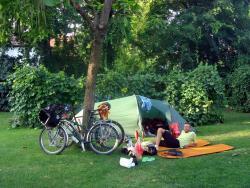 Hungary has developed dramatically in recent years in response to the increasing demand for cycling tourism. Today, Hungary has more than 2,000 kilometres of cycle track with another 200 in Budapest. In addition, cycling services have risen to European standards, with repair shops, and hotel, camping and catering outlets dotted along the cycle tracks. Cycling is now permitted in a number of hilly and woodland regions, including national parks, but it is important to know that cyclists must keep to marked routes. Since the 1990s there has been an increasing social demand for a healthy way of life along with an environmental consciousness, so cycling has become part of society's active lifestyle. The biking route around Lake Balaton is approximately 200 km. The lake and its surroundings make up the country's main recreational area and the centre for many of Hungary's mineral-rich quality white wines.